As sweet as cinnamon: Exciting Launch of Among The Gum Tress! This exciting day has finally arrived! We are a merry band of Australian Designers sharing a few of our original and varied designs freely for your personal use. 'Among the Gum Trees' is the brainchild of Jenny of Elefantz, who has bought together 9 established and emerging designers to offer something new and exciting to the world......their own original designs... to download free of charge. Free of charge?! Are we mad?! Well no, but we do affectionately refer to each other as ' the Nutters'... he he... and we look forward to sharing our designs, our news and our 'nutty journey' along the way with you, and among the gum trees! SO when is this happening? Starting on Monday 5th October and each Monday after that for 8 weeks, there will be a FREE Christmas themed design for you to download. With a free Christmas design offered to you weekly you will have your handmade Christmas all wrapped up with time to spare! Then after Christmas, on the 7th of each month, starting 7th January 2010 there will be one FREE design a month from one of the 9 'Gumtree Designers'. So that means one FREE design a month for 9 months FREE for your personal use to download. As well as free designs, you will be able to read monthly news from our editor and notification of all new for sale pattern releases. NOW because we are a generous bunch of nuts, we are EACH HAVING A GIVEAWAY to celebrate the launch of Among the Gum Trees. And you can enter all 9 of them!...... But as we have become good at teasing..... We will be launching our ' GIVEAWAYS' tomorrow!!!! 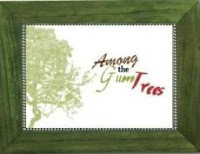 So in the meantime please start spreading the word and add our Among the Gum Trees button to your blog! I look forward to launching my 'Giveaway' tomorrow and if you become a follower of my blog I will give you an extra entry! oh well done, and good luck to you all. I along with many may others will certainly look forward to this! That is exciting Dawn - well done - and I love the new look to your blog. Congratulations and many thanks , great idea ! Congratulations, Dawn! How fun it must be to be one of those designers. Look forward to this new adventure!!! Hi Dawn, I've just discovered you through the "Nutters". Congratulations on a great idea. I'm looking forward to the projects and following all the blogs. A wonderful idea, I wish you every success. Just a thank you to you and the other designers for starting this wonderful blog full of free designs. I will be going to each of the designers blogs and thanking each of them. I am so excited!! Thanks to all!! Fantastic idea. So caring and generous of all you ladies. I have added the button to my sidebar on my blog and am a follower of yours and the groups...very sweet! Gorgeous fabric! I love the Gum Tree blog - what a great idea! Okay... button on my blog - check; follower of Gum Tree and your blog - check; comment - check! Hello Dawn, I have become a follower of your blog. Dawn I am a follower of Among the Gum Trees too. I'm now a follower of both blogs. Thanks. What a great idea ! I cant wait to start in octobre - thanks so much ! Ofc I am a follower now of everyones blog. 1st of October should be a lucky day for me! It was already when my daughter was born on that day 11 yrs ago. Thanks for the chance! Thanks for the opportunity to be included in giveaway/drawing. I look forward to following the Gum Nut Designers. Love the fbaric and pattern in your giveaway - very thoughtful. I have added myself as a follower to your blog - thanks!! I have added your button to my blog! I will follow you, follow you where ever you may go....sound familiar? Maybe I am dating myself here..anyways love the give-away and I am a follower and I wrote about your new blog and put your button on yesterday. Check it out! Love the new and old blogs! I'm following your blog and Among the Gum tree blog. Thanks for sharing. It's very exciting to have all of you work together on this new blog. Sharing ideas is what keeps me inspired to continue crafting, stitching and sewing. Thanks for sharing with us. I've become a follower for yours and gum tree blogs. Don't have one of my own, no time with all I'm reading. Love the giveaway and all the BOMs. AU Rules!! Congratulations I hope you girls all do well and thank you personally for offering a giveaway. Thank you for giving me the opportunity to enter to win! Hello Dawn, I am a follower of your blog, a follower of Among the Gum Trees and have put the button on my blog and linked it back, as requested. I have posted the link on my blog. I am a follower of you. I am a follower of Among the Gum Trees. I've read about you, posted you and I'm definitely following you....you all keep me inspired!